Before we jump into the Crocs in snow story, let me set the scene. The first night, Bluegrass and I cowboy camped on top of Beauty Spot. It had been sunny and 75 during the day, so we were expecting a warm night. The wind rocked us to sleep and we woke up in a cloud. Our gear was soaked from condensation so we didn’t head out until 10:30 a.m. once our gear dried out in the sun. All things considered, it was a beautiful night and morning. We were expecting another sunny day in the 70s. Day two’s hike started up one of my favorite mountains, Unaka Mountain. 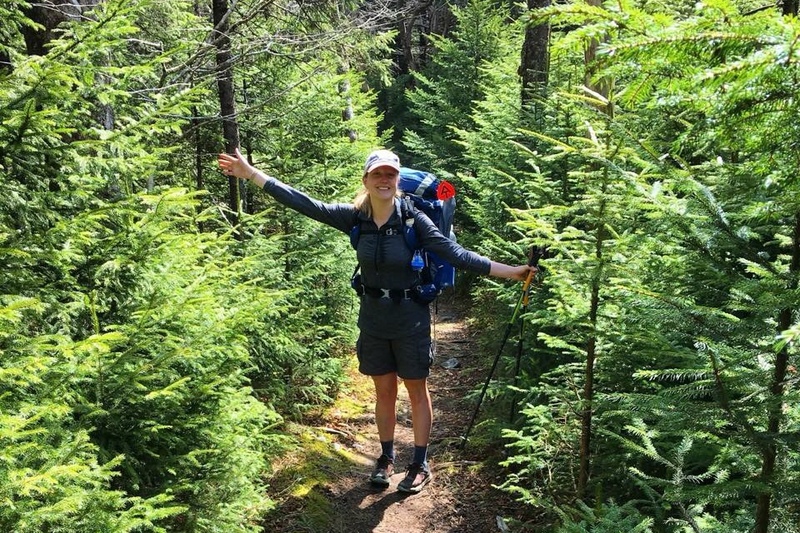 I felt like a Who in Whoville trekking through the magical, dense spruce tree forest. There was even a spruce tree decorated with Christmas ornaments. 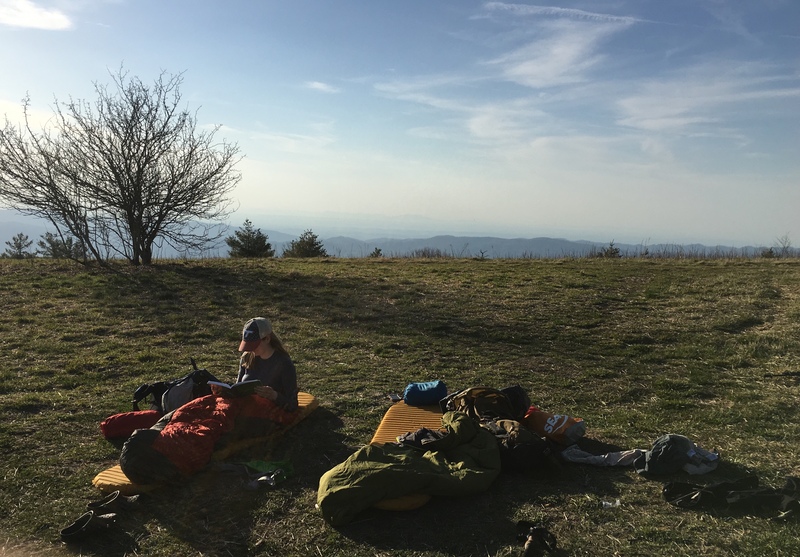 The warm day ended with burgers and beers at a trail magic party hosted by 2017 thru-hikers. Once again, the day was perfect and the weather was da bomb. At the beginning of day three, I told a fellow thru-hiker that I planned to camp on Little Hump Mountain that night. To which I got the response, “Are you crazy? Have you seen this forecast?” We were expecting 60 mph winds and two inches of rain. It probably wasn’t the best idea to sleep exposed on top of a mountain bald. Bluegrass and I decided we would aim for Overmountain Shelter instead, a big barn that would (hopefully) keep us warm and dry. I started my hike up Roan Mountain and the sky was falling. I could have jumped in a pool and been drier. At that point I was sheltered by more spruce trees so I was just dealing with rain and not the wind. As soon as I crossed Carvers Gap, it was time to hike Round Bald and Jane Bald. I took one step into the exposed space and immediately got knocked down by the wind. “WTF?” For the next few miles, I pretended I was Bear Grylls on “Man vs. Wild.” I was screaming into the wind “Woohoo, show me what you got!” The rain turned into hail and started pelting me at 60 mph. I started yelling “Not the face, not the face!” I probably looked like an insane person now that I think about it. I played a new game I call “stream or trail.” The trail was flooded so I couldn’t tell if I was actually following the trail or a stream. I would just commit to a path and go with it. I finally found my way across the balds where my Canadian Ironman-racing friend, Louis, was waiting for me behind the tree line. He said he was about to come back out there after me if I didn’t show up in the next ten minutes. It’s nice to know everyone is looking out for each other. We made it to the shelter and hung up all of our clothes and gear to dry. The wind was still getting at us in the barn so we covered the wall with our tent rain flies. 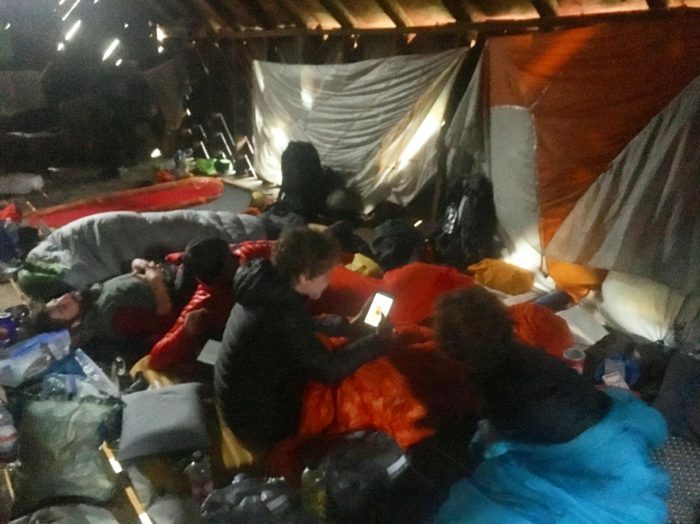 We fit about 30 people in the shelter, which helped keep us warm that night. I woke up the next morning and looked through the crack in the barn floor to see downstairs. It had snowed. As the first of the 30 of us found the energy to mosey on out of our sleeping bags, we hear: “Guys, our stuff is frozen solid.” Anything that had gotten wet the day before (which was literally everything we owned) froze overnight. My shirt and pants were as stiff as a 2×4. Good thing I was only ten miles from town because I was going to hike in my pjs. I packed up and went to put on my trail runners. They were the stiffest things I owned. For the life of me, I could not get them on. I tried sitting on them to warm them up. I even threw them at the wall to try to break them. With the temperature still way below freezing, my shoes were not going on. “Welp,” I thought, “Crocs it is.” I reluctantly put my camp shoes on over my Darn Tough socks and got to hiking. Within the first two minutes, my feet were soaked and lost feeling. “Good, I won’t feel the pain,” I thought sarcastically. Once again, I found myself exposed on a mountain bald with the wind trying to throw me off the trail. Louis passed me and said, “We need to stop meeting like this.” The snow continued to fall and my mind was distracted by the beautiful scenery. (No pics because my phone died when the temperature dropped. Sorry. Just imagine Narnia and replace centaurs with deer.) Around noon, I made it into town and found a heater. Frick yeah! All things considered, I had an absolute blast hiking through that weather. I felt like a total badass and survived the roughest days yet with a great mind-set. It’s experiences like this that make me realize how much I love backpacking and feel proud for following my dream of hiking the AT. They say the trail ruins your life in the best way possible. You crave adventure and refuse to settle with a mundane lifestyle. My sister says I’m going to be an ultra trail runner after this and I couldn’t agree more. This has been the best experience of my life and I can’t wait to spend another four months or so taking it all in. What a beautiful read! I know your Mum and it’s clear to me where you get your amzingness from! Really enjoyed your descriptive, natural story. I’m so glad it’s a true one and one with more chapters❤️ Meeting up with your Mum for coffee tomorrow! I was up on the balds Sunday going SOBO. It was something. Glad you made it. Woohoo….Go Meredith! I’m enjoying reading all your posts! You’re amazing.